"I have unfortunately pulled up with an injury that has stopped me running in my tracks. Saturday 25th May (just over a week ago) I warmed up for my 5k race and felt soreness in my left hip. I just ran on because I've had aches like this before in my hips and it just goes away the next day. It hurt all through last weeks training, and I've stopped all running since last Friday. It hurts to walk on and do one legged squats. 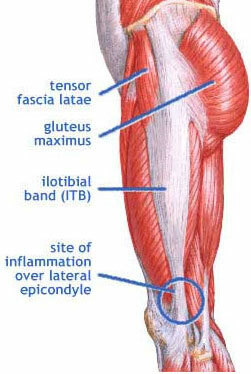 It feels like a deep pinch in my hip, as well as near my medial glute. I've had my hip flexor worked on and that was tight, but hasn't relieved the pain. Have also had my back, hamstring, ITB, and glute area worked on without relief. Going to see my favourite massage guy this Saturday to see if he can help. Was wondering if you could provide me with some advice?" The most common cause of the pain you are describing is strain to the small muscle that stabilises the hip during single leg squats, called "Tensor Fascia Latae". If this is not the case for you, please reply with a photo with the exact spot marked with a felt pen, thanks. Unaccustomed running over hilly, uneven terrain; Running drills that involve high leg raises, or changes in direction; Gym exercises such as box jumping, Pilates, aerobics classes. If this muscle has been damaged, it is most often experienced as a sharp pain in the side of the hip and a feeling like the affected leg may collapse during a single leg squat. There may be associated spasm and dysfunction felt in the gluteal and there may be pain in the sacroiliac joints and low back. Rest the legs for no longer than about five days. Any longer is likely to be counterproductive. Use the time out to exercise the rest of the body. Deep tissue massage of all of the muscles about the hips, including backside, low back, hamstrings, ITB and thighs. But only once a week as per the usual advice found in my many earlier articles about deep tissue massage. Do both legs. You may be able to self massage the tensor fascia: Sit in a chair; Lean forward so that the point of the elbow can dig into the tensor fascia muscle. Keeping the elbow firmly on the muscle and using pain to guide you, firmly grind away at the tissue with pressure. It may be quite uncomfortable at first; but the pain should diminish over the following few minutes. The muscle may also feel as if it releases and softens. Do this for several minutes then leave it for a week. Then repeat weekly for as long as is required for a 100% recovery. Stretch the hips every which way - Gently! No excessive stretching during this period of healing. Ensure your protein, mineral and vitamin intake is on the high side, especially magnesium which is associated with muscle spasm when deficient. Exactly what you need to increase, or even reduce, is best determined by a current hair tissue mineral analysis. Gradually reintroduce running from about five days. Have a rest day between each running workout; but this rest day is best an active day doing vigorous exercise other than running.